March 17, 2012 by Alphageek in "alphageek", "cooking", "discovery"
This is an article that should change things up here. This site cut its geek cred on restaurant reviews, and an occasional review of something like an Asian grocery store, what we are cooking for dinner, some gadget like flexible skewers or what is on the hot sauce shelf of the alphageek's refrigerator. Mrs. alphageek spent some time looking around at Amazon.com, for new experiences for me to relay to you, our patient readers. 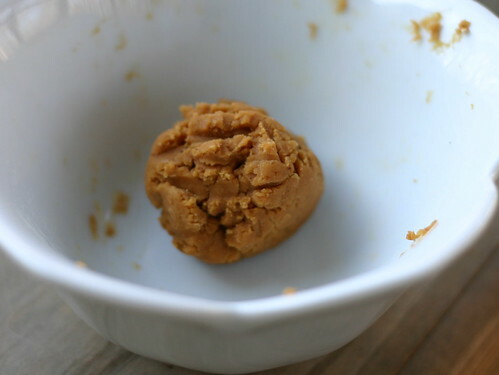 Today, we have a product that immediatly generated some thoughts along the lines of "I have to review that", This product is called PB2, Powdered Peanut Butter. Don't ask me how it can be called powdered and butter at the same time, but it is. Sort of like partial zero emissions. How can you have part of zero? I guess that is how large debts are run up. I paid $6.99 for 6.5 ounces. I guess there is a lot in there, because it is a dry powder, so 6.5 ounces should go a long way. 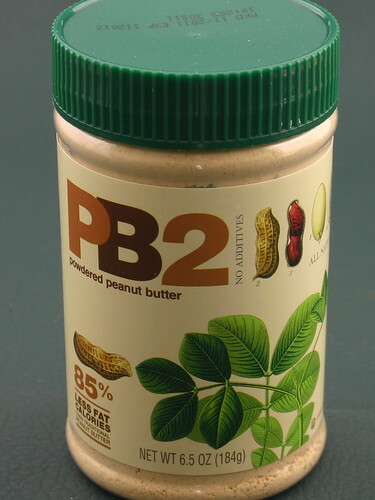 PB2's label says that the oil and fat are pressed out of the peanuts, after the peanuts are roasted. I think you should keep this product away from people with peanut allergies. There are some directions about adding two parts of peanut butter powder to one part of water. Of course, I ignored these directions, at least to get started. I simply sprinkled a little on my tongue, simply to see what the taste would be. I found out that the taste was simple: peanut butter. I know that sounds strange, but I expected something more processed in flavor. Instead, it tasted very natural. Hey, low fat and sugar too, so you eat it whenever you are worried about calories. Okay, so now I decided I would try the directions. Here, I mixed up what the directions on the jar said to do. As you can see, I got more of a paste than a butter. However, I like the taste. It does not have the creaminess of peanut butter, but the taste is right on for peanut butter. You can also see that I did not pretty up the bowl before taking the picture. That is how you know I really do this stuff and don't just rip off other pictures from cyberspace. I mixed a little more water, and it became a little more butter like. I liked the nut taste without the sugar. Growing up, there was a product called Goober. Goober was peanut butter and jelly poured into one sticky mess in a jar. My sister and I pestered my Mother to buy Goober one time. Big mistake because Goober was simply sticky, sweet and awful. Our Mom made us eat it all too. I thought it might be fun to try to make a real Goober, by simply adding some PB2 to some jelly on bread, and see what came out. I first just had some of the pictured above paste, with some jelly, on a cracker.The peanut taste was almost buried by the jelly. I then tried some varying amounts of powder with jelly on a cracker, but they did not get it done for me. I then mixed the jelly with some powder, and this did the trick. I had a good recreation of peanut butter and jelly on a cracker. Oh, and it was much better than I remember Goober ever tasting. What else could one use this for? I think it would be good with chocolate, but you would need lots of the powder. I also think it would be great to try to make a satay sauce with. Maybe adding it to something that finishes with a peanut flavor, like pad thai. In the end, this is an interesting product because of the low fat and low sugar aspects. Given the price, it is a rather expensive alternative, but a great way to get peanut flavor in, without the fat and sugar of peanut butter, or crushed peanuts.